Imagine you are a leader. 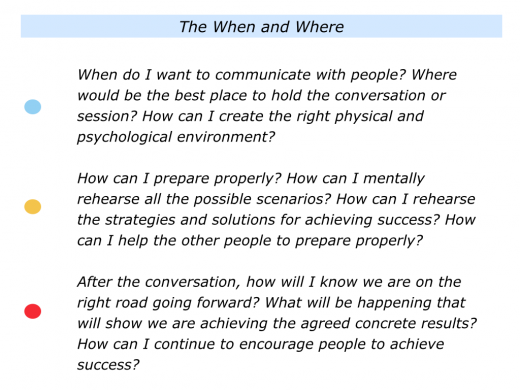 Your work will probably involve meeting with individuals, small groups and large gatherings. 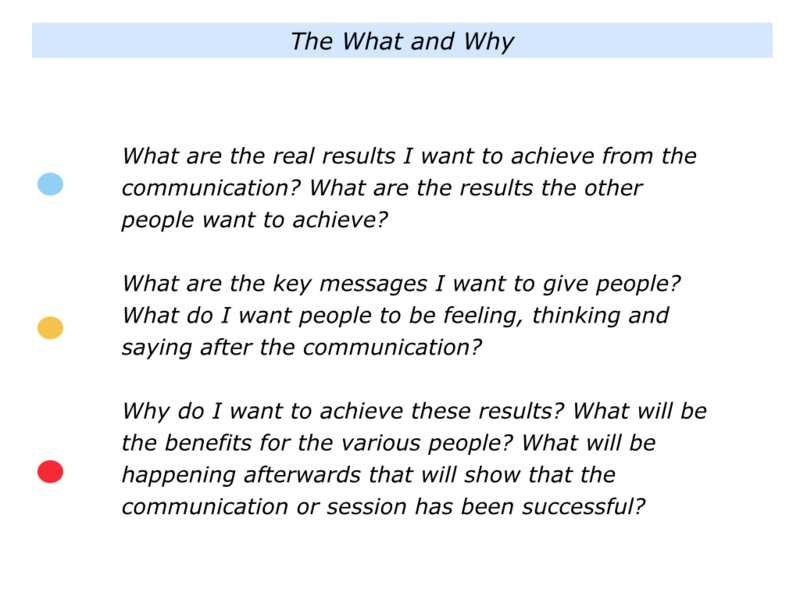 Whilst you may follow similar communication principles in each situation, the way you express these will differ in practice. 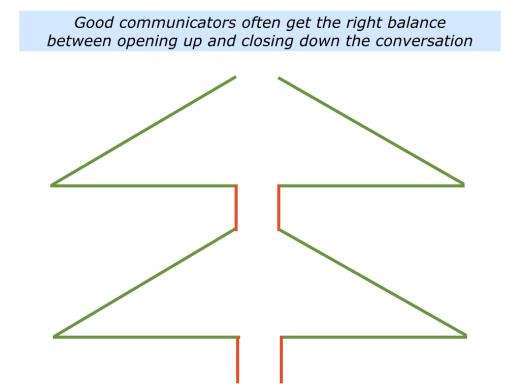 Good communicators aim to connect with people. 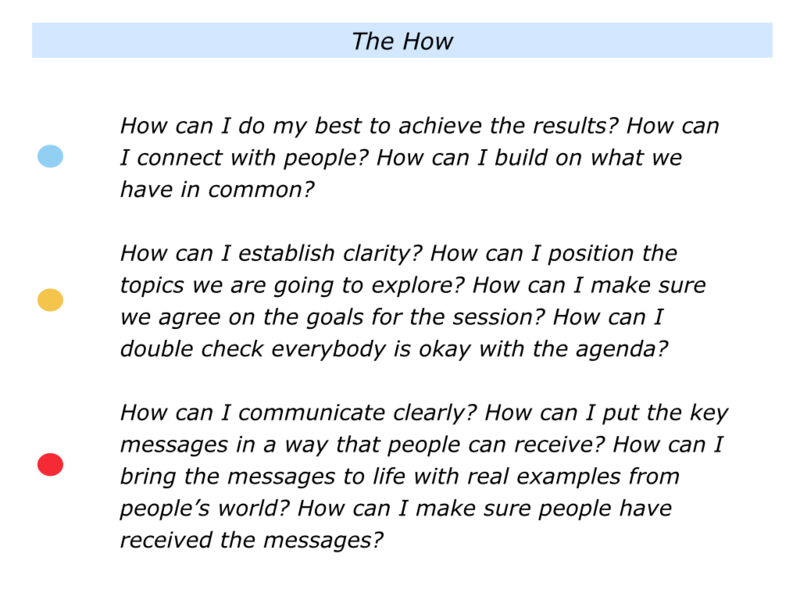 They often start by building on what people have in common and clarifying the goals for the conversation. They give and receive information, find creative solutions to challenges and make clear contracts about the future. If appropriate, they ensure that everybody moves forward towards a shared picture of success. 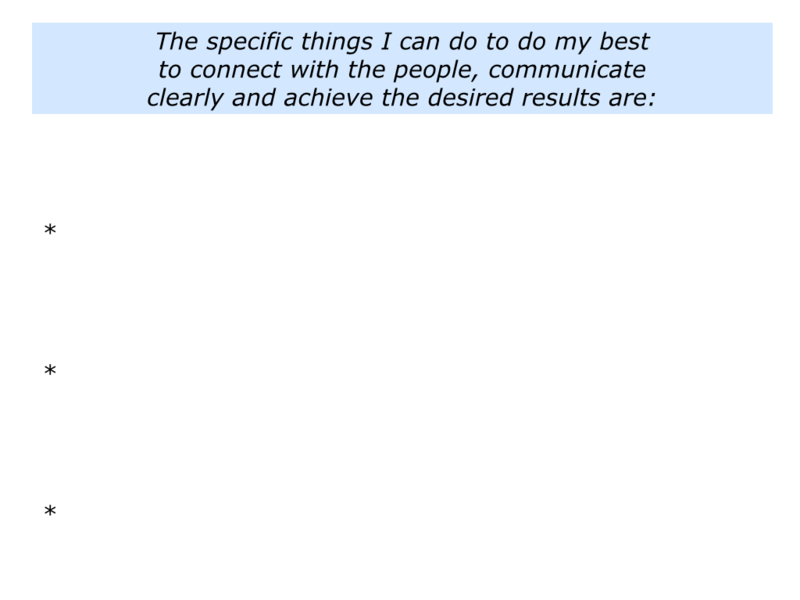 The specific results to achieve – for both them and for the other people. 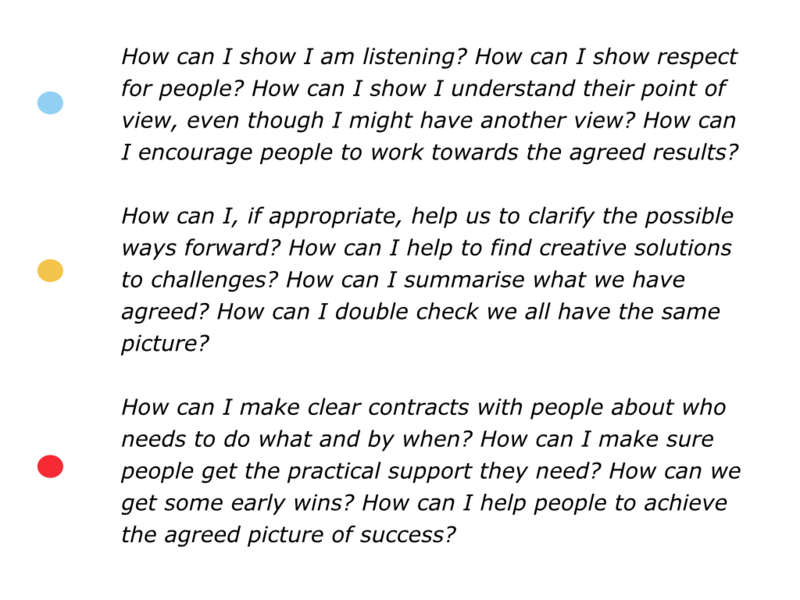 The specific strategies they can follow to do their best to achieve these results. 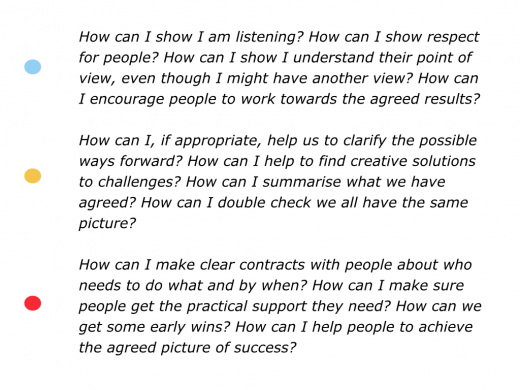 The specific challenges they may face and how to deal with these successfully. Whilst this may sound mechanical, such preparation allows them to be fully present and spontaneous with people. 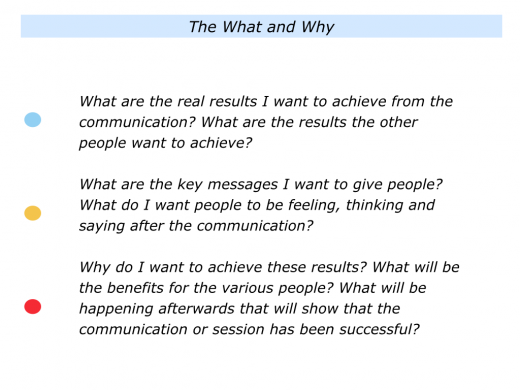 Poor communicators are often more concerned with what they want to say, rather than with the results to achieve from the conversation. 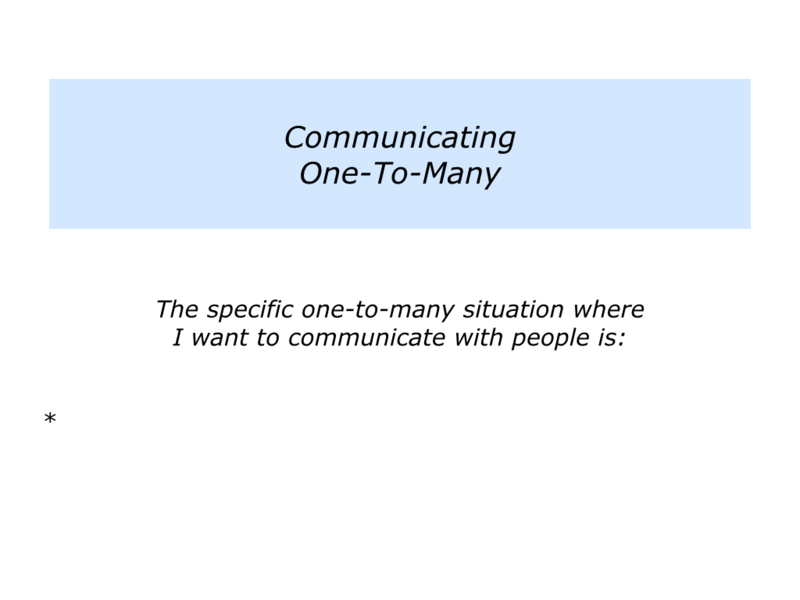 Later we will explore how to connect with people in one-to-one, one-to-few and one-to-many situations. Few leaders are good in all these situations. 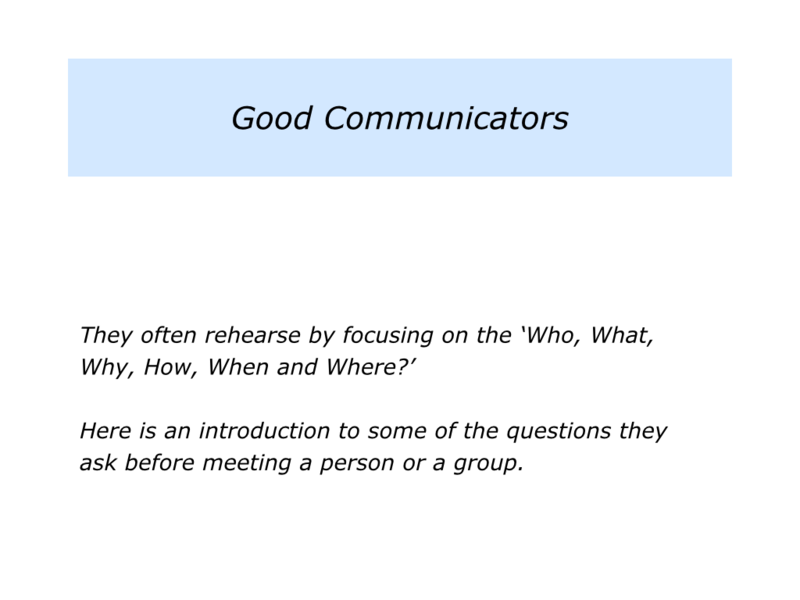 Before then, however, here is a short introduction to some of the principles followed by good communicators. Different people obviously follow these in their own ways. 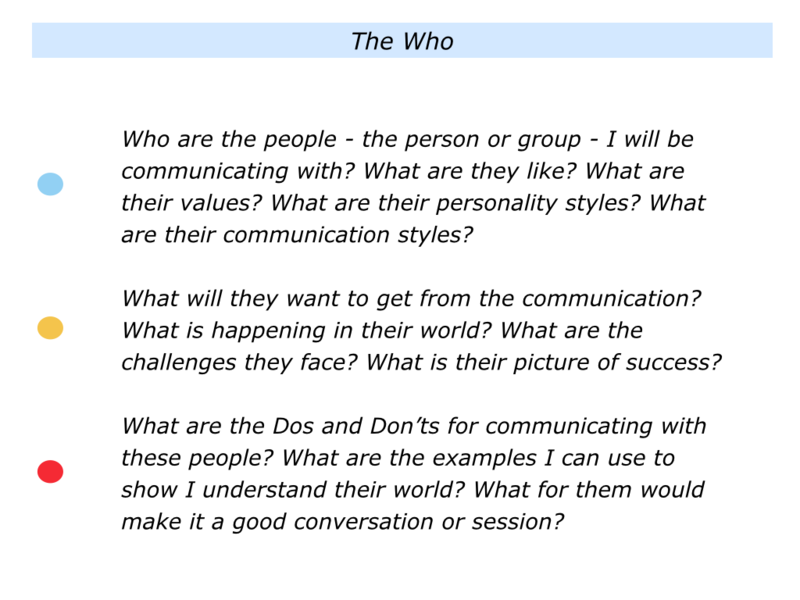 These are general principles that people can follow when preparing to communicate with others. Let’s explore how it is possible to follow these and other principles in different situations. 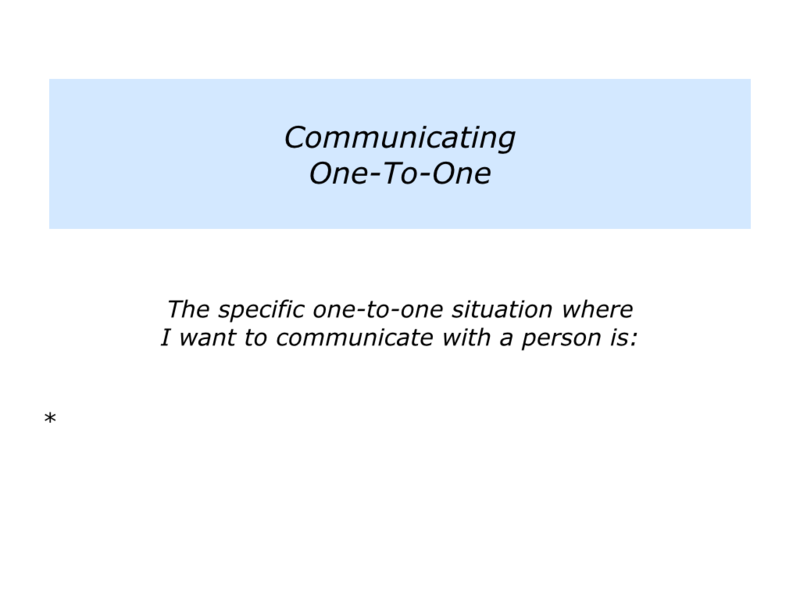 Imagine you are going to meet somebody in a one-to-one situation. 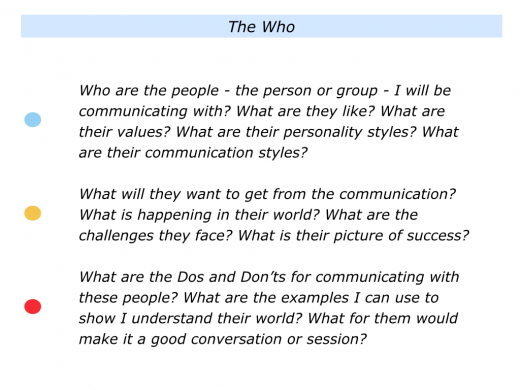 You may be meeting a customer, a team member, your boss or whoever. 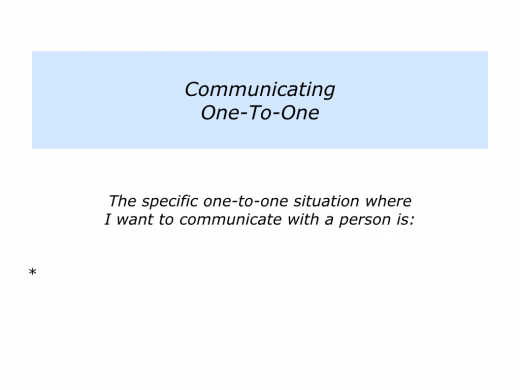 Describe the specific situation where you may want to communicate with somebody on a one-to-one basis. 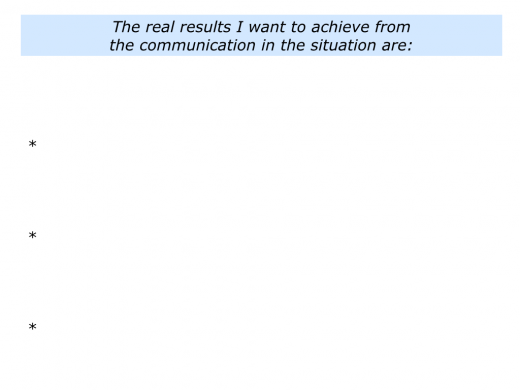 Describe the real results you want to achieve from the communication in the situation. Describe the specific things you can do to connect with the person, communicate clearly and achieve the desired results. Imagine you are going to meet people in a one-to-few situation. 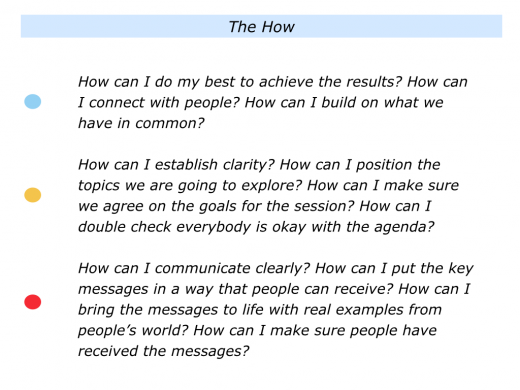 If you are the leader in the conversation, you may be conducting a team meeting, having a catch-up conversation with a small group or facilitating a workshop. 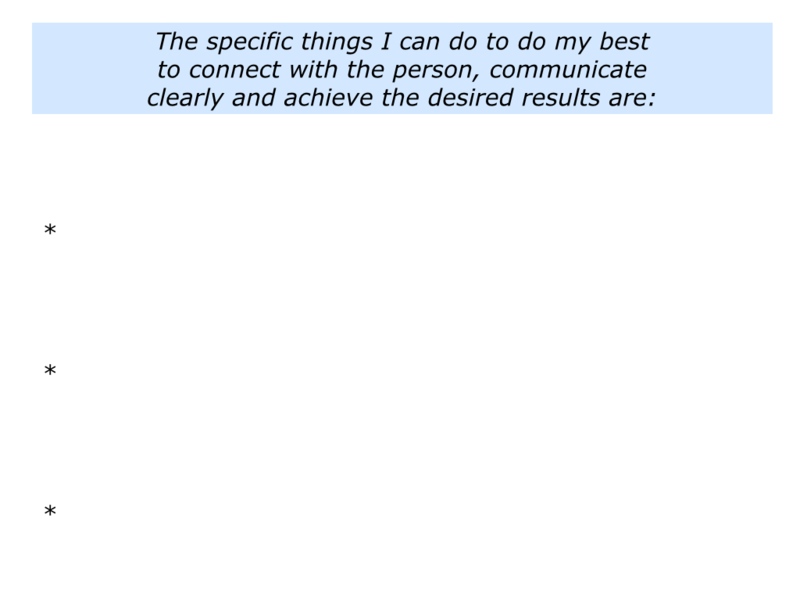 To clarify the specific goals for the meeting. To check if anybody would like to add other items to the agenda. To begin exploring the first topic. 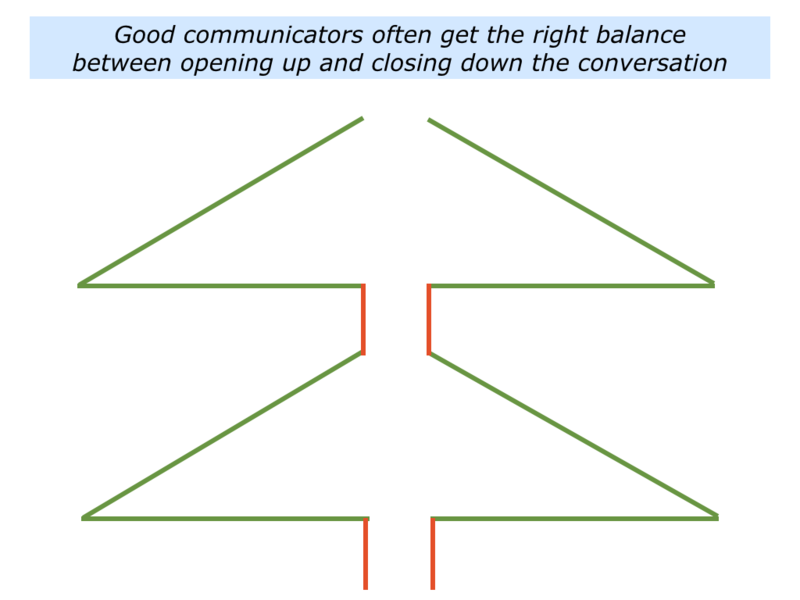 It may be useful to open up the first topic, explain your views, invite others to share their views, listen carefully and then, at an appropriate time, close down the topic. Making a decision, you will ensure everybody is clear on the way forward. Moving onto the next topic, you will continue until the agenda is completed. Sometimes you may play a different role in a group, such as when meeting with peers or simply contributing to a departmental meeting. This is a situation that catches out some people, especially if they get bored. Whilst they may function well when leading a meeting, they lapse into unprofessional behaviour with peers. 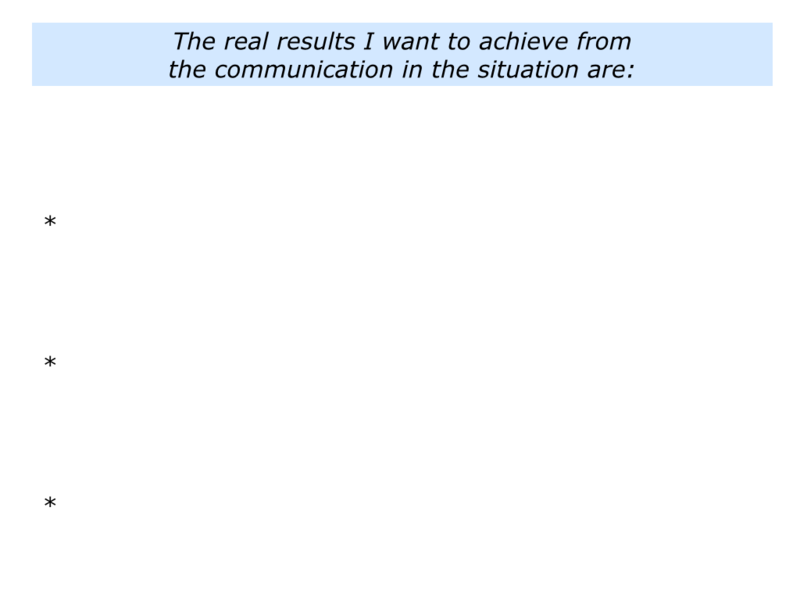 To clarify the role you want to play and the contribution you want to make to the situation. To anticipate everything that may happen in the situation. 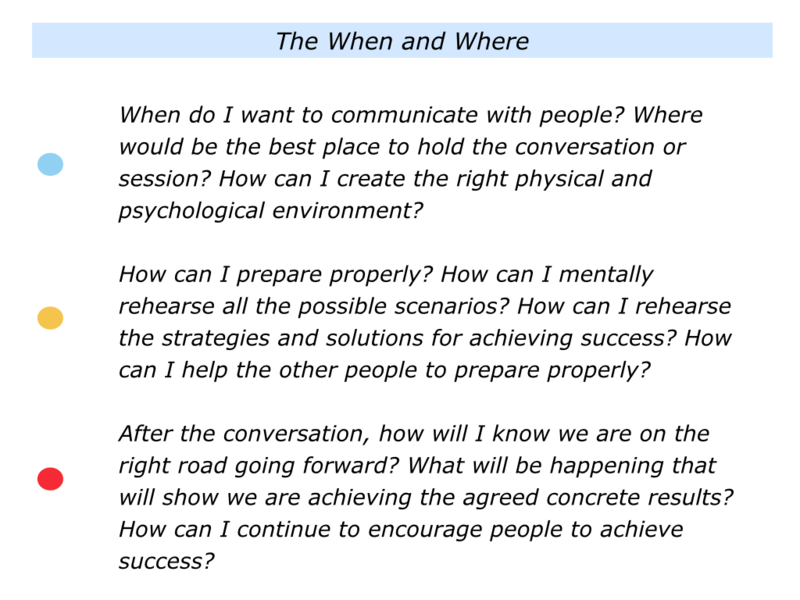 To rehearse how you want to communicate and contribute to achieving a successful meeting. You can then go in and do your best to make a positive contribution to the meeting. Describe the specific situation where you may want to communicate with people on a one-to-few basis. 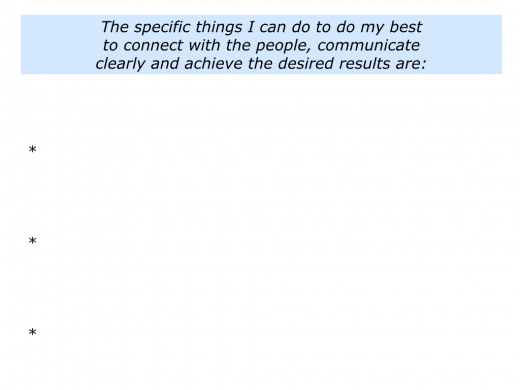 Describe the specific things you can do to connect with the people, communicate clearly and achieve the desired results. “I enjoy individual and small group meetings, but I feel uncomfortable talking to large group,” said one person. “Maybe it is because in smaller sessions I can see how people respond and also get into dialogue. This is more difficult in big groups. The things you say seem to disappear into the ether. 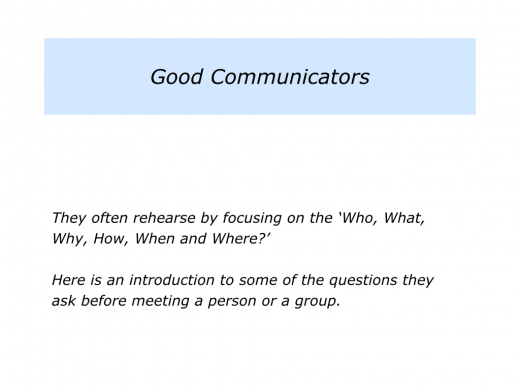 Good leaders develop the skills of communicating in one-to-many situations. This includes some of the following themes. They aim to be themselves in the situation. They use their own voice, language and examples. They aim to be professional, but also express their personality. They know their audience. They know the challenges these people face in their daily work and world. They clarify the key messages they want to give people. They know how to communicate these messages in a way people can receive. They know how to bring the messages to life with examples. They spend a lot of time preparing. They practice until they can forget. They go through the process of rehearsing, relaxing and then rising to the occasion. They start the session by positioning what they are going to say. 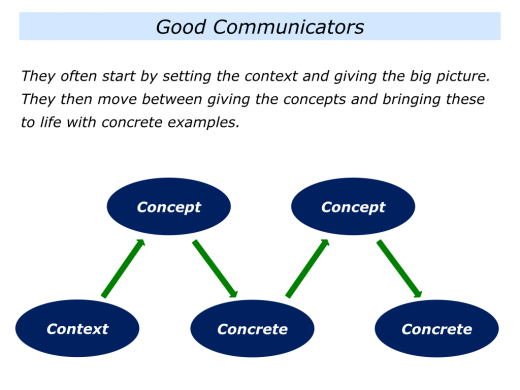 They often give the context – the bigger picture – before going on to give concrete examples. This helps people to see things in a wider context. They give the key messages to people by moving between the concept and the concrete. They give an idea and then illustrate it with an example that people can recognise in their daily lives. They conclude the session by outlining the next steps. They also, when appropriate, give people the chance to integrate and implement the ideas in their daily work and lives. 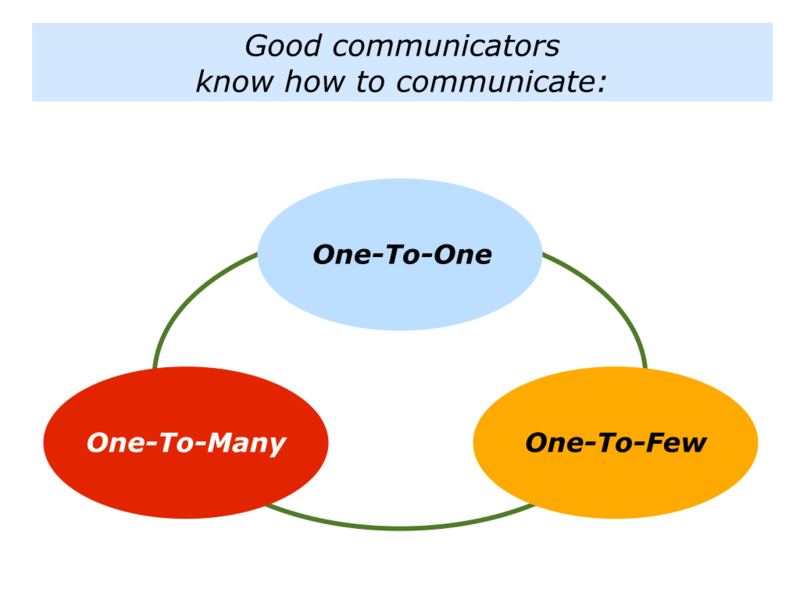 Some people are good communicators one-to-one, some one-to-few, some one-to-many. Whatever situation they enter, they can find it useful to prepare properly and then do their best to achieve the desired picture of success. 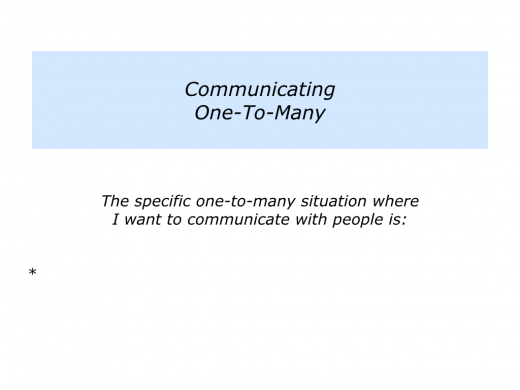 Describe the specific situation where you may want to communicate with people on a one-to-many basis.